I'm making a rag quilt and would like to get the spring loaded snips to use to cut the fringe. What are the best ones for this? Fiskars makes a rag quilt snips. 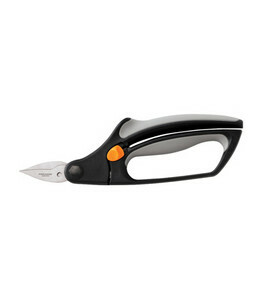 The are much easier to use than their regular short bladed scissors as they are made to cut through several layers of material at once. They saved my hands so I could still make rag quilts. I have a small pair of Fons and Porter red handle scissors, they are not spring loaded, but I like them. I have tried the ones with springs, for me they don't work as well. But everyone is comfortable with different scissors. I also use the 8 1/2" Fiskars scissors that are made specifically for rag quilt snipping. They were expensive, but well worth it. I have carpel tunnel & arthritis and the Fiskars work better than any other scissors I own for rag quilts, even the small spring-loaded Fiskars scissors. I have made a lot of rag quilts and have tried 2 different types of Fiskars. Both worked okay, but I wasn't thrilled with them. I am now using these and have been much happier with them..... http://www.joann.com/heritage-spring...nips/prd28078/. I also saw where you can order these from Walmart online for $30....but I'd rather support Joanns. I got mine at a local quilt shop. I have made 7 rag quilts and used 2 different kinds of Fiskars. Neither one of them can even touch these heritage. It's like comparing a cadillac and a VW. I have the Fiscars but have been much happier with the Fons and Porters. They are lighter and easier to use for me.